For years, Billy McGuigan and his brothers Ryan and Matthew have thrilled audiences around the country with their all-request Beatles tribute show, Yesterday and Today. Billy has had a successful and fulfilling career as a musician and entertainer, having created three critically acclaimed musical tribute shows. Every year fans are delighted with the return of the toe-tapping, sing along show Yesterday and Today to the Omaha Community Playhouse. One fan in particular, Kent Hanon, has been coming to Yesterday and Today on New Year's Eve for years to celebrate the holiday and watch his former students perform an energetic rendition of The Beatles' music. Kent taught Billy and his brothers drama at Bellevue East while they were in high school. Kent is planning on attending Yesterday and Today again this New Year's Eve to see Billy and his brothers showcase their talent and their love for the Beatles music. Be sure to catch this all-request Beatles tribute show as it will have you dancing in the aisles and singing along to every song. Share your stories and relive your memories with your favorite Beatles songs. No two shows are the same and every show is a guaranteed energetic and exhilarating time! Tickets are on sale now. The show runs from December 7- 31 in the Howard Drew Theatre. Tickets: $38; Groups of 12 or more: $32. Special New Year's Eve Performances at 7 p.m., tickets: $50 and 10 p.m., tickets: $75. There are no Twilight tickets. For tickets, call (402) 553-0800, click here or come in today. Check out clips of performers from two years ago here. We’re back with Round 3 of our popular musical theatre showcase. We’ve got the piano, you’ve got the Broadway dream… Hosted once again by the incomparable Jim Boggess. I am a retired teacher from York and I traveled to Omaha in September to audition for A CHRISTMAS CAROL. Imagine my surprise and elation when I received a call saying the Playhouse would like for me to join the cast as Marley. But in the back of my mind, I must confess, I wondered how I would be received in Omaha, if I would be viewed as an outsider, perhaps even sense a bit of resentment from a few along the way. I am pleased to report that I have been warmly welcomed into the circle of cast and staff. Everyone has treated me kindly and patiently and graciously and enthusiastically, and even helped me find housing during my time in Omaha. That first open cast meeting when I saw children of all ages returning and greeting each other with smiles and laughter and warm embraces, I realized this is not just a cast of just another show, but a family that looks forward to joining together to celebrate this unique experience. And now I get to become a part of that family, and I am feeling so lucky, so fortunate to be included. Whole Foods will be hosting a community support day for the Omaha Community Playhouse. Shop at Whole Foods on Tuesday, Dec. 18 and Whole Foods will donate 5% of the day's net sales to OCP. A Christmas Carol has been a beloved holiday tradition at the Omaha Community Playhouse for 37 years. Families across the country are drawn every year to this magical production of Charles Dickens' classic Christmas story. Have you ever wondered how A Christmas Carol comes together every year? The process is long and complex and requires the help of an experienced and dedicated production staff. Last year NET filmed the entire process and is airing the special one-hour documentary “From Casting Call To Curtain Call” on Friday, November 16. A Christmas Carol is a huge undertaking every year. Not only does OCP produce its Mainstage production but it also puts on touring versions through the professional touring arm, the Nebraska Theatre Caravan. October and November are a few of the busiest months of the year, as the production staff works diligently to coordinate the precisely choreographed rehearsal schedules of multiple full scale productions. NET documented every aspect of the Mainstage process by filming auditions, rehearsals and performances up until closing night. The documentary features interviews and special commentary from Directors Carl Beck, Susie Collins and Amy Lane, Musical Director Jim Boggess and Stage Manager Jeanne Shelton. Cast members share their thoughts on the production process and how they work to provide the same level of authenticity to their characters as in past years. For some, it is their first year; for others, it is their 25th year. Nonetheless they must all work together to create the memorable characters and scenes that make A Christmas Carol a true holiday classic. Nearly one hundred people, mostly volunteers, make these shows come to life. While A Christmas Carol may be a complex production, experienced staff members and a dedicated team of volunteers make the process work like clockwork. After Jerry Longe takes the last bow as Ebenezer Scrooge on closing night, the sets get torn down, props get stored and costumes get put aways until next year. 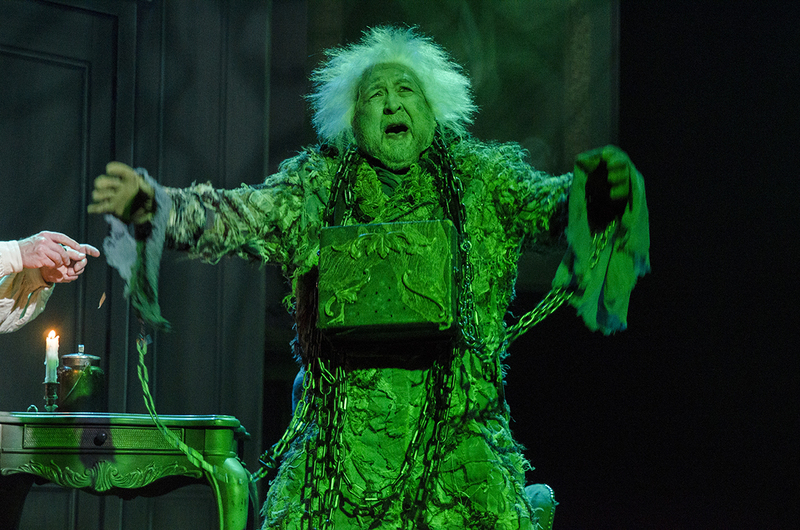 See A Christmas Carol this holiday season, and watch as Ebenezer Scrooge takes us on a life-changing journey filled with beautiful costumes, exquisite music, perfectly crafted sets and special effects second to none. Perfect for the whole family! Be sure to check out the NET documentary: “Casting Call to Curtain Call” on Friday November 16, to catch an in-depth look at the making of A Christmas Carol. Tickets are on sale now, and the show runs Nov. 16-Dec. 23 in the Howard and Rhonda Hawks Mainstage Theatre. Tickets: Before Dec. 15, $35 (adults) $24 (students), Dec. 15-23, $39 (adults) $28 (students); Groups of 12 or more: $32 (adults) $18 (students). There are no Twilight tickets. Call (402) 553-0800, click here or come in. Time to celebrate! Friday, November 30, 2012 marks the 1,000th performance of A Christmas Carol at the Omaha Community Playhouse. Former cast and crew members are invited to attend the show for $25. For this special discount, contact the OCP Box Office at (402) 553-0800. Enjoy the arts with a Metro Arts and Culture Pass! If you are a season subscriber to the Omaha Community Playhouse, in the month of November, you can receive 10% off tickets to Aspen Santa Fe Ballet's "Nutcracker" through Omaha Performing Arts. You can also receive $1 off admission at Strategic Air and Space Museum.